Dress up any home or office decor with new window treatment designed to compliment and enhance your Maryland home or business. Choose from our wide selection of fabrics for drapes, window dressings and window valances, window treatments designed to fit any room in your Maryland house or business. Compliment your blinds with window treatments. While they’re an attractive alternative to shades, blinds simply by themselves can be plain. However, you can easily dress up blinds with window treatments. Whether you want to add a custom window valance, or you simply want a more finished look that only curtains can provide, window treatments makes it easy to blend plain blinds with any decor. Measure your windows. Before purchasing Window Treatments in yourMaryland home or office, it is necessary to properly measure the space so that your window treatments fit your window and blinds. Take your measurement from the points on the window frame that you want the window treatments to cover. You can extend your window treatments beyond the frame and onto the wall to make your windows seem larger, an especially good idea if you have small windows or want to display as much of your window blinds as possible. It always helps to bring in a few photos of the window and your measurements if you decide to come visit us in our showroom. This will give our consultants a better idea of what you are trying to achieve when designing your window treatments. Decide on Window Treatment Maryland Home or Office. If you like the look of your blinds and shades but would prefer a more finished appearance that goes with other windows in your home or business, place a custom window valance over the top of the window frame. You might also choose sheer panels to frame the window and show off your blinds. For windows that need a little more coverage than blinds can provide alone, a full drapery or curtain set may be appropriate. 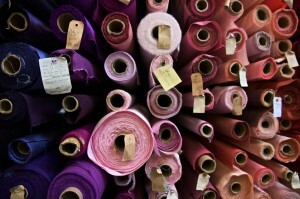 Choose the right fabric. You can make curtains, window valances and window shades in a number of different fabrics, including silk, velvet, brocade or even simple cotton, all of which can complement window blinds very nicely. If you have a high-traffic home with small children, select a window curtain fabric that will be easy to wash and care for. If easy-care fabric is not an issue, you have the option to select “dry clean only” fabrics to go with your wooden blinds. Pick a design that’s right for you. Gather inspiration from your existing home or business decor when selecting the design and color of your custom window valances or drapes. You can choose a neutral color and theme to tie in throughout your home that will show off your beautiful window blinds, or you can choose a contrasting color and theme to add interest. Look for a pattern that matches a sofa or ties in with the color of the carpet, or you can use a patterned window treatments to contrast with a room full of solid colors. Call us. Let us serve you better by scheduling an appointment at 703-780-8899 or stop by our showroom to start designing a window treatment.